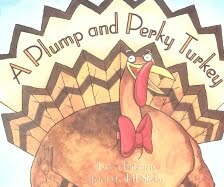 Tomorrow, it will have been a year exactly, since we read Teresa Bateman's Plump and Purky Turkey for stART (a story + ART link-up, at A Mommy's Adventures), and made candy corn, turkey cookies. ...and they inspired, the turkey craft below, reusing our tissue, and contact paper, candy corn, from our windows. I traced a circle, on cut open lunch bag, for the girls to cut. Or rather, for E (age 5) to cut. I cut the circle out for C (age 4). They glued on google eyes, and drew beaks, and feet (and eventually snoods), with markers. Then, they glued on the candy corn, which I had carefully removed from the windows. C, chose to glue hers, on the front of the circle. E, glued hers on the back. Finally, once they were dry, we taped them back onto the windows. For a new, seasonally appropriate, display. For more story stretching arts, and crafts, check out this week's stART link-up, at A Mommy's Adventures. I love it! Those cookies look good. We always make turkey cupcakes, but I think we'll have to try the cookies. Funny - we are reading this book today and it will be our stArt project book too! I seriously want to make those cookies! Oh my goodness I LOVE these cute little Turkeys so much...my friends think my love of candy corn is very funny, so I think we will have to make these for art group this week. Both the cookies and project!! So cute!!! I love how they catch the sunlight in the window! what a great way to reuse those! I don't know what's cuter- the cookies or the crafts! I've been following your blog for a few months now and I enjoy reading it. I would like to mention another blog I came across a few weeks ago that offers alot of free printable math games and so much more. bwjules1 - Thanks - I'll check that out! I think you could almost write your own book on candy corn crafts! You are so creative! Oh yeah- getting two decorations in one craft- how awesome are you? I LOVE it! What a great idea to reuse the candy corn craft! I shared this on twitter & fb -- love how they turned out! Your cookies and this turkey craft are both over-the-top adorable! I think we may make the craft. Thanks for another creative idea:-)!! Yummy! Love the cookies. The book looks like a fun read. Thank you for sharing. Oh how pretty I love the "suncatcher" element of these. And the cookies look awesome too!! The cookies and art are beautiful! Hurray for candy corn - yum!